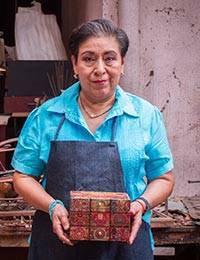 Ana Maria Gonzalez celebrates Mexico's legendary lotería with the design of this decorative chest. Gonzalez works in decoupage on pinewood. Similar to bingo, the Mexican lotto features 54 different images and numbers. It is believed to have been brought to Mexico in 1769, when it was reserved for the upper classes. Eventually it became widely played by everyone, and is a trademark at traditional fairs.